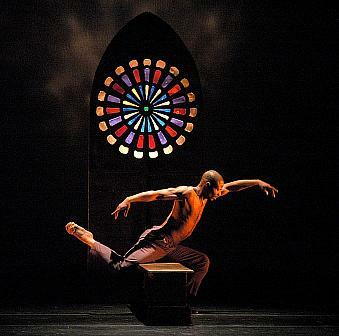 The Wylliams/Henry Danse Theatre would like to thank the Muriel McBrien Kauffman Foundation for their support and generous gift that makes it possible for WHDT to present works by nationally and internationally renowned choreographer Bill T. Jones. This project is supported in part by an award from the National Endowment For The Arts. Financial assistance for this project has been provided by the Missouri Arts Council, a state agency. Veteran dancer, DeeAnna Hiett, and newcomer, Marion Willis, playfully chase each other in "Ice Fire". At 8:00 pm on Friday, Sept. 9th, Wylliams/Henry Danse Theatre (WHDT) performed its first concert for the academic year at White Recital Hall. It opened to a small but very enthusiastic audience, which grew in numbers for the subsequent performances on Saturday and Sunday. "There was so much going on this weekend to compete with... it is hard for people to make all the performances," one audience patron lamented. 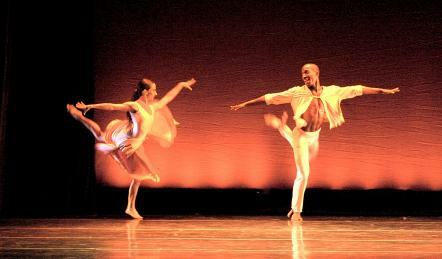 Marion Willis and Holly DeWitt in "Bachianna"
The show opened with a lilting, classical barefoot modern piece choreographed by popular artist, David Parsons, and done to the music of Johann Sebastian Bach. Performed as an ensemble, this colorful, playful piece, "Bachianna" featured dancers in red and black costumes and was well received by an appreciative audience. 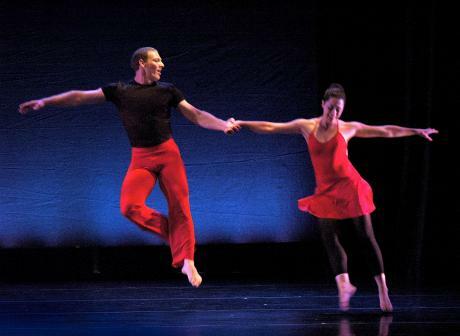 The next number, "Give Your Hands To Struggle", was a modern dance solo featuring DeeAnna Hiett performing in a red satiny dress, and choreographed by Jawolla Zollar to music by Bernise Johnson Reagan with Amy Horowitz. A dramatic piece, this dance gave one the feeling of being trapped and breaking out of confinement of the shadows. 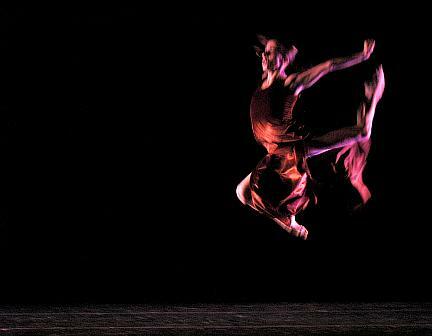 "Anything DeeAnna Hiett does is great... this piece was very dramatic... and tells the story well in the form of dance," said Marbeth Schnare, a prominent NYC photographer in KC to visit close friend, Mary Pat Henry, Artistic Director and co-founder of WHDT. Paul Chambers, former dance faculty, was also impressed with Hiett's performance. "DeeAnna Hiett is such a fabulous dancer," said Chambers. "She did a fantastic job in her solos, as usual." 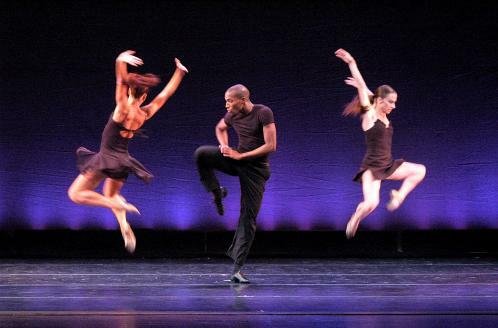 The next dance, "Havoc", was an ensemble suite of unusual and energetic pieces by innovative choreographer and movement therapist, Bill T. Jones, who has been featured in PBS's "Great Performances" and in a Bill Moyers documentary. The presentation of this work by WHDT was made possible as a result of support from the Muriel McBrien Kauffman Foundation. Additional support for the performance was provided by the National Endowment For The Arts and by the Missouri Arts Council. Jennifer Medina, Joe Pilgram, Tracy Vogt, Edward Franklin, Barbara Russo - "Havoc"
Behind the scenes, "Havoc" had some technical difficulties, but the dancers took the anomalies in stride. None of the mishaps were apparent to the audience. Joe Pilgram, who is featured prominently in "Havoc", was philosophical about the difficulties, saying, "A dancer always feels that a performance could have been better... but these pieces were definitely entertaining... and definitely kept us on our toes... it seems like every live performance is a unique artistic experience." Jerry White, a regular patron who has been coming to WHDT concerts for years, particularly enjoyed this piece, and did not notice the difficulties. She commented, "I do not think anyone has done this number better than the Wylliams/Henry company... there is such incredible variety in this company... I wish they had a larger audience in Kansas City.... they are like an undiscovered little jewel in our city that has performances that rival those of national companies." A patron put it a bit more succinctly, saying simply, "The piece is colorful, engaging, and dynamic... and Joe Pilgram is awesome...!" Dancer Jennifer Medina was very matter-of-fact about the performing the piece, despite the surprizes. She said simply, "I was thrilled and honored to do the piece... and hope to have the opportunity to do it again." Barbara Russo, Jennifer Medina, Holly DeWitt, Marion Willis in "Change of Heart"
The second half of the program opened with a suite of jazzy numbers done to music by Peggy Lee and choreographed by Kansas City Ballet Artistic Director, William Whitener. The suite, "Change of Heart", featured a solo by DeeAnna Hiett to the song, "Fever", which brought many hoots and hollers of approval from the audience. An clear crowd-pleaser, this suite brought the audience to its feet in a standing ovation and sustained applause. "This was a great concert... this was one of my personal favorites," said NYC photographer, Schnare (referring to the jazz 'Fever' solo done by DeeAnna Hiett). "My other favorite was the Jones piece, which had a tremendous amount of energy to it," she added. Presenting this piece had its own challenges for, except for Hiett, the company has all dancers. Whitener commented, "DeeAnna Hiett really led the way.... except for her, we had an all new set of cast members... and restaging a piece with new cast members makes for a whole different performance... especially since I try to tailor the choreography to take advantage of the strengths of each dancer." Another prominent person in the dance world is also a fan of Hiett's. He commented enthusiastically, "She is simply the best dancer in the whole world." The next number was a sensuous, masculine piece choreographed by WHDT co-founder, the late Leni Wylliams, who specialized in strong, male solos. Performed by relative newcomer to the company, Edward Franklin, the warm, sinewy moves in "Sweet In The Morning" seemed to suit his bronze dancer's body to a tee. "This was my favorite piece in the concert," said Anthony DeCarlis, a junior in the Dance Department program. "I particularly appreciated the intent and the quality of movement, and how they came together in Franklin's performance." A similar sentiment was expressed by Schnare. "Edward's solo was beautiful... the whole feeling of it... he is great in it... and he has such a beautiful body to use as his artistic instrument." Joe Pilgram and Jennifer Medina in "Ice Fire"
The closing number was another ensemble piece, "Ice Fire", choreographed by Fred Benjamin and done to music by Pat Metheny & Lyle Mays. 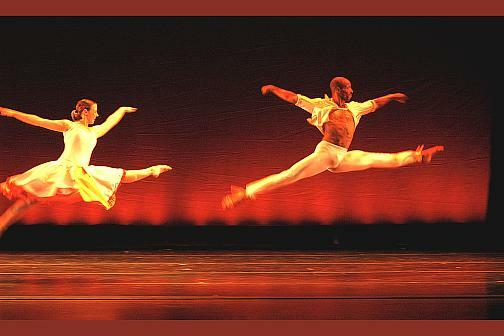 True to its title, this piece is highlighted by its contrasts of slower, smoother choreography in the first part, with leaping, energetic moves in the second part. 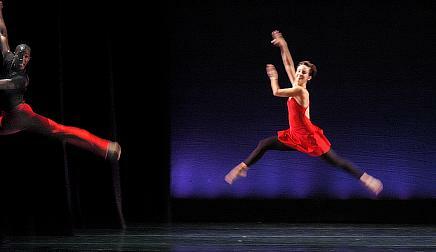 The piece is a playful one that the dancers enjoy performing. "I really enjoyed doing 'Ice Fire'... it is a fun piece," said dancer, Holly DeWitt. "We really have fun with it... we can share smiles and each other's energy and excitement... which really makes the piece a good experience for us to perform." The audience picks up on the playfulness of the dancers as well. Schnare commented, "I really think 'Ice Fire' is a lot of fun... I love all the leaps." Other patrons experience the energy as even more uplifting. Geneva Price, a prominent Jazz Singer in KC area who performs with the Wild Women of KC, recently featured in the KC Blues Festival, is a WHDT regular patron. She commented, "In general the programs here at PAC are terrific... and particularly the Wylliams/Henry company.... from the first note of music, you become transcended in time and space... everything else melts away... sometimes the performances leave me speechless... it just takes my breath away... there are no words come to describe the experience," said Price. And on the "Ice Fire" piece, she added, "For me, this piece was an electrifying experience... it made me want to rise to my feet... almost like a spiritual experience... it was so moving for me." The concert is also uplifting to young dance students as well. "I really enjoyed the concert," said Ronald Belger, a sophomore in the Dance program. "By watching the other dancers I get really inspired... because this is what I really want to do with my life." Dance faculty member, Lindsey Rosemann, was also pleased with the concert. "I am so pleased to see that Mary Pat Henry has kept such variety and quality in the pieces she selects for the company... they really keep the audience thoroughly engaged." Michael Shook, Member of the Board of Directors for Wylliams/Henry, and passionate supporter for the company, was very open about his opinion of the show, when he expressed himself without reservation and in full voice at the end of concert, declaring to one and all, "This is one of the best dance companies in Kansas City...!" The audience applauded his declaration.